SpaceX has made landing a 549,054 kg rocket that is 70 feet long and only 3.66 meters in diameter and has reached an altitude of 247 km and fallen at a speed of up to Mach 7.9 within .7 m of the target on a drone barge at sea almost routine. The latest SpaceX launch placed a satellite into orbit and the first-stage rocket soft-landed on a barge. 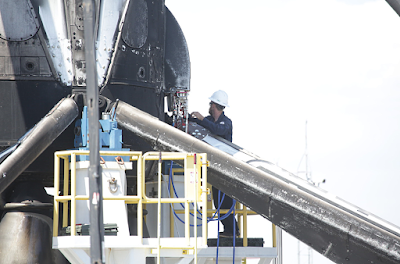 Successful recovery of first stage rockets seems to be becoming routine for SpaceX and that will significantly reduce the cost of launching a satellite, bringing us closer to the dream of low-cost Internet access at every point on Earth. When the Falcon 9 reached an altitude of 72.6 kilometers, the first stage separated and began falling toward Earth. Following separation, there were frequent nitrogen-thruster bursts to keep the rocket vertical and position it directly above the landing barge. When the first stage had fallen to 61.9 kilometers, it's rocket engines were fired to slow it's decent. The following images show the view from the ground and from the rocket. The rocket has touched down -- speed is 0 km/hour and the altitude is 0 km. For a 22-minute video beginning with the launch and running through the soft landing, click here. 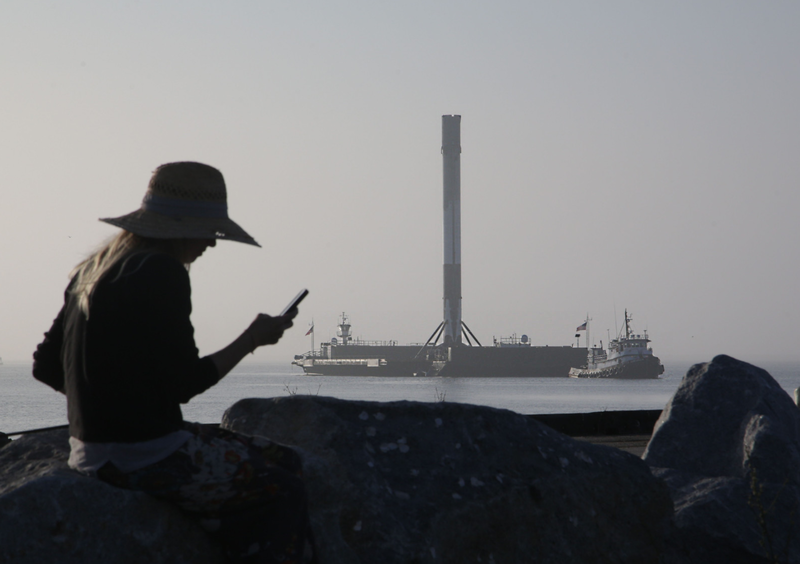 SpaceX has made landing a 549,054 kg rocket that is 70 feet long and only 3.66 meters in diameter and has reached an altitude of 247 km and fallen at a speed of up to Mach 7.9 within .7 m of the target on a drone barge at sea almost routine. You can see 15 pictures of a recovered rocket being brought back to Hawthorne California for refurbishing here.